I felt so badly for one of my son’s ballet teachers after she had a tough week that I offered to bring a snack to share with her after class. I asked “salty or sweet” and she responded, “Both?”. The trouble was that I was feeling entirely lazy and had zero motivation to leave the house on the one day a week I didn’t need to do so. The solution was to use only things I had on hand to turn out a dessert that could turn around an awful week. I opted to put pretzels in and on a decadent chocolate sheet cake. I’m still not sure WHY I did it, but I’m awfully glad I did because whoa. Just whoa. The base for this decadent Chocolate Pretzel Sheet Cake is The Pioneer Woman’s signature, extra rich and buttery “The Best Chocolate Sheet Cake Ever“. 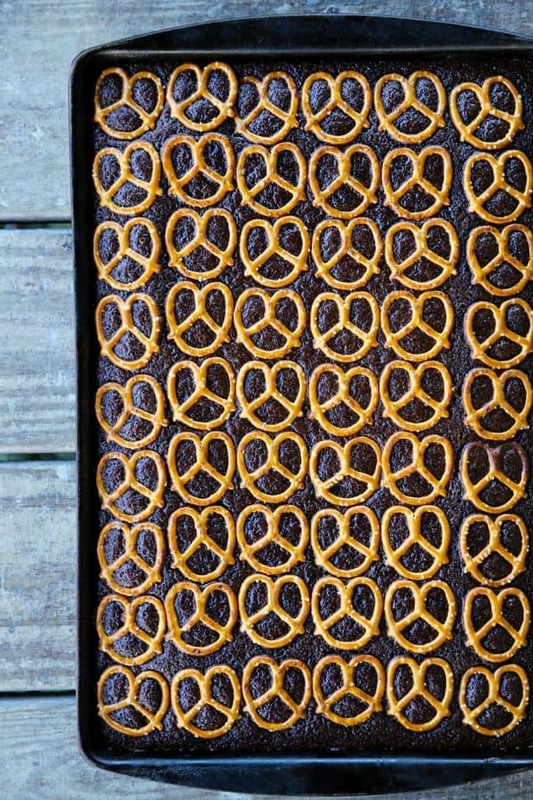 Baked into the super moist* chocolate sheet cake base is a layer of little pretzel twists. *Hello, I know some people get worked up about that word, but it is honestly the perfect word to describe the cake and I refuse to stop using it because, frankly, describing a cake as being damp, humid, soggy, wet, steamy, dank, or dewy is far worse in my opinion. When the cake comes out and the warm glaze is spread all over the cake, another layer of pretzel twists is arranged on top. The glaze sets up under the pretzels and holds them to the cake. Now, you can stop here if you want. I’d get it. It’s delicious and it looks as pretty as can be. HOWEVER, if you like to gild the lily, AND I DO, you can warm up a little of your favourite peanut butter until it thins out enough to drizzle over the cake. 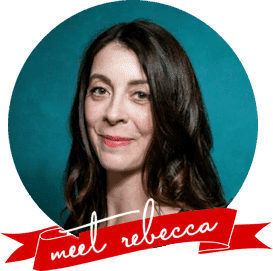 In that case (swoon) you will have a Chocolate Pretzel Sheet Cake with Peanut Butter Drizzle and you will quite likely have a bunch of people who want to be friends with you long enough to eat a piece of your cake. You’ve been warned. By the way, the Chocolate Pretzel Sheet Cake (with the peanut butter drizzle) did the job. As far as I know, the rest of Miss Marie’s week was completed in a chocolate fueled burst of energy. I advise using tiny twists instead of larger twisted pretzels because it makes cutting the finished cake into serving size portions easier. Be aware that the pretzels baked into the cake will not be crunchy, but neither will they be soggy. 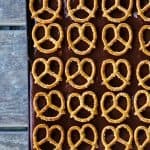 They become part of the cake and lend their distinctive pretzel-i-ness (technical cooking term) to the overall flavour. The pretzels on top of the glaze, however, will remain crunchy. Hooray texture! The peanut butter drizzle is technically optional… Mainly I say this because I have friends with peanut butter allergies. If allergies aren’t an issue, I highly recommend putting the peanut butter drizzle on the cake. It is so. darned. good. Super rich, decadent chocolate sheet cake with a layer of pretzels baked into it, with a thick chocolate glaze, another layer of crispy, salty pretzels, and an optional drizzle of peanut butter. Bring water to a boil in a small saucepan. While that comes to a boil, melt the butter in a medium saucepan over medium low heat. Whisk in the cocoa. Whisk the boiling water into the butter and cocoa mixture. Let it boil for 1 minute then remove from the heat and set aside to cool briefly. In a large bowl, combine the flour, sugar and salt. Stir together and set aside. Pour the chocolate mixture in and whisk until there are no more dry pockets. In another bowl, mix together the buttermilk, baking soda, vanilla and eggs until even, then pour into the flour and chocolate mixture and stir with a spoon until smooth. Pour into an ungreased jelly roll pan (or rimmed baking sheet). 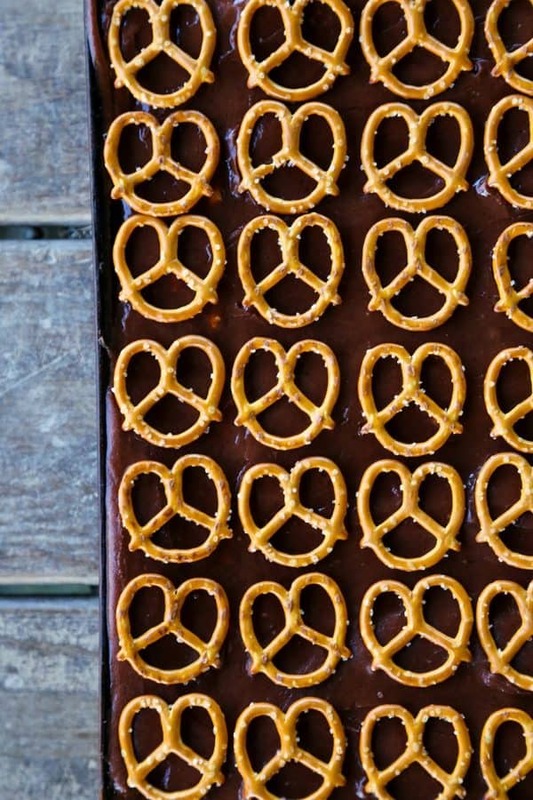 Arrange the small pretzels in rows over the batter and then bake for 20 minutes. Melt the butter in a medium saucepan over medium-low heat. Whisk in the cocoa powder until smooth. Whisk in the milk, vanilla and powdered sugar until smooth. As soon as you remove the cake from the oven, pour the warm icing over the top, taking care to distribute it as evenly as possible as you pour it, since you'll want to avoid spreading it with a spatula as much as possible. 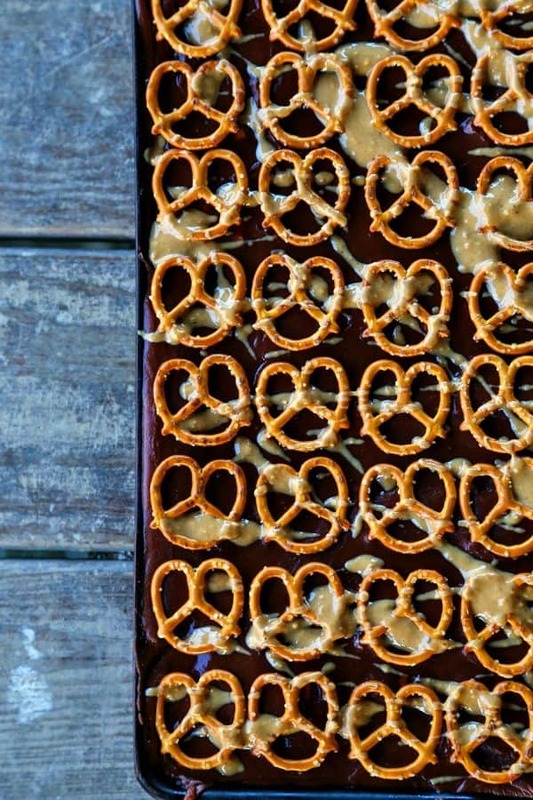 When the icing is evenly distributed, arrange another layer of small pretzels in rows. Allow the cake to cool completely. If desired, gently warm the peanut butter in a microwave safe bowl or in a saucepan until thinner. Stir well and drizzle over the cake. Allow it to sit for 5 minutes. Slice the cake into pieces as large as the pretzels on top and serve. 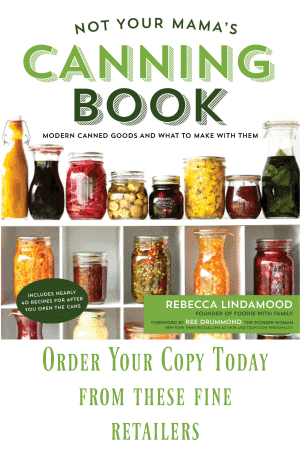 Leftovers can be kept tightly wrapped at room temperature for 4 to 5 days. “Both” is always the very best answer. This cake looks incredible!! “…because, frankly, describing a cake as being damp, humid, soggy, wet, steamy, dank, or dewy is far worse in my opinion.” Hahaha. RIGHT? THANK YOU, my sweet friend. It is truth. Imma gonna keep saying moist. Hey, that’s a very cool idea! A 5-star one! This looks so amazing!! I love to make it in coming weekend. I LOVE cake, all time I love cake recipe, your recipe is awesome I will try to make this recipe next weekend for my beloved son. Thanks for the grate recipe post. Yum! It looks so delicious, it is an awesome recipe. I love cake all time.